Radioactive dust, also called nuclear fallout, is produced when a nuclear blast vaporizes buildings, trees, animals, and people. The resulting radioactive matter particulates fall to the Earth, the same material that is sucked into the mushroom cloud seen moments following a nuclear explosion. In addition to causing radiation sickness in humans, this fallout will eventually contaminate soil, aquifers and all other components of an ecosystem many years following initial exposure. "Air burst" nuclear weapons, or bombs that detonate high in the atmosphere, will not produce as much fallout as bombs that detonate near the ground, or "ground burst" bombs. Further, weather conditions at the time of the detonation will either reduce or intensify the amount of fallout generated. Rain tends to concentrate fallout of nuclear material and produce even more toxic health hazard in localized areas. 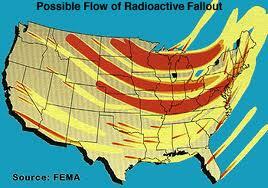 Windy conditions at the time of the blast will facilitate the spread of radioactive fallout as well. Gamma rays--useful in small amounts but dangerous when emitted by nuclear bombs, gamma rays are types of electromagnetic radiation that can penetrate all materials up to a mile away. Protection from gamma rays requires moving far away from the source of gamma rays or wearing special protection that is both thick and dense. Depending on how near they were to ground zero and how well they managed to protect themselves, survivors of a nuclear blast may ultimately experience cancers, genetic defects, respiratory and cardiac diseases. Ionizing radiation is the direct cause of DNA damage leading to birth defects and cancers such as leukemia, thyroid, lung and breast cancer. More immediate medical conditions caused by high doses of radiation exposure include serious skin burns, severely impaired immune system functioning, gastrointestinal sickness and hair loss. Researchers are still evaluating the effects of people who lived through the Hiroshima and Nagasaki bombings as well as the victims of the Chernobyl nuclear disaster in Russia and finding that the damage done on a genetic level is worse than originally anticipated. Additionally, other long-term health issues produced by fallout of nuclear materials will emerge from a rampant spread of infectious diseases as a result of poor living conditions. These include dysentery, hepatitis, pneumonia, cholera, tuberculosis, typhoid, and meningitis. If warned of an imminent nuclear explosion, the best thing to do is to put as much mass between your body and the nuclear radiation as possible. Have a shelter such as a basement or other prepared living area ready that contains everything necessary for surviving up to several weeks or even months--water, food, medical supplies, radios. Obtaining a radiation detection device and learning what constitutes safe levels of radiation is equally vital to surviving nuclear detonation as food and water. Dosimeters, Geiger counters and gas flow proportional counters are some radiation detectors used to determine the safety of the air following a nuclear disaster. Potassium iodide pills (KI) are taken to counteract the effects of radioactive iodine contained in contaminated air and food supplies. KI inhibits this substance from entering the thyroid gland and possibly causing thyroid cancer. However, potassium iodide cannot prevent radioactive iodine from being absorbed by the body, nor can it protect from other radioactive contaminants. It will help infants, children and those lacking sufficient amounts of iodine from possibly experiencing serious injury to the thyroid. The best protection from nuclear fallout is placing as much mass (or distance) between you and the fallout as possible. After establishing yourself in such a safe haven, the only thing to do is to simply wait until radiation levels have fallen to levels acceptable enough to allow exposure to the outside elements.